Squee! It’s…look, CW, can we talk? I know we don’t get along that well, largely because I am not a twelve-year-old girl and am therefore not part of your target audience. I know I’m apparently part of that 10 percent of women in the world who simply don’t understand America’s Next Top Model (“congratulations, you’re still in the running toward becoming irrelevant”). I probably hurt your bottom line by putting off my Supernatural viewing until summer reruns. But really–must we punish me with Smallville? Sigh. Fine. Squee! It’s Kyle Gallner on Smallville tonight! We’ve been keeping an eye on Gallner since he broke my heart and my brain in Veronica Mars (I think Susannah sent out search party at one point. No, for me, not the actor). In addition to playing Beaver…I’m sorry, Cassidy Casablancas on VM, you may have seen Gallner in the obligatory Law and Order appearances, guest roles on shows such as Judging Amy, Medium, Bones, and Life, and in recent recurring roles on The Shield, CSI: Honey Barbecue (NY), and Big Love. He’s been an absolute delight as The Flash Impulse (whatever, CW) on Smallville, as he’s the only person with superpowers who seems to enjoy himself. We’ll see if he enjoys himself tonight, or if, given that he’s recently been cast in a starring role in the Nightmare on Elm Street remake, he’s about to become unavailable, making Impulse the rumored character death wrapping up the Smallville season. Don’t kill your one spark, Smallville! Tonight on the CW at 8pm Eastern and Pacific. Squee! It’s triple squee spotting on Lie to Me tonight. You may remember the rapture I experienced when Randolph Mantooth showed up on Criminal Minds a few weeks ago. Now his Emergency! partner in crime, Kevin Tighe, pops up as well. Roy DeSoto : Johnny Gage as Jon Baker : Francis Poncherello and Frank Hardy : Joe Hardy. You may also remember Tighe as the athletic governor Josh didn’t want entering the primary after President Bartlet’s MS was announced on The West Wing and as Locke’s no-good, kidney-stealing dad on Lost. He’s also appeared on everything from Leverage and the Laws and Orders, ER and Chicago Hope, to Freaks and Geeks. He’s joined by D.B. Woodside, aka Pretty Principal Robin Wood from Buffy the Vampire Slayer. He’s filled other positions of authority as a president on 24, as well as appearing in Numb3rs, Grey’s Anatomy, and Once and Again (and, heaven help him, Viva Laughlin). Both Woodside and Tighe were in the gone-too-soon Murder One, as well. Finally, Jason Beghe is also in tonight’s episode. If you’re an old-school X-Files fan like I am, you might be looking at Beghe’s name and thinking, “That seems familiar. Did he date Gillian Anderson once upon a time?” But then you will remember that it was actually David Duchovny. Well, not that Beghe dated Duchovny, but that he kind of shoved Duchovny into acting. So we kind of have Jason Beghe (who has also appeared in fare such as Life, Veronica Mars, American Dreams, Melrose Place, and Picket Fences, among many others) to thank for The X-Files. Of course, that means he’s also kind of to thank for Californication–you be the judge. You can catch Tighe, Woodside, and Beghe on Lie to Me on Fox tonight at 8pm Eastern and Pacific. Since ABC has bumped Scrubs and Better Off Ted to next week to accommodate the presidential news conference, you can even catch them with no guilt involved (unless missing the presidential news conference makes you feel guilty, too). Folks should probably be relieved that TV Bacon wasn’t around during the heyday of Veronica Mars. 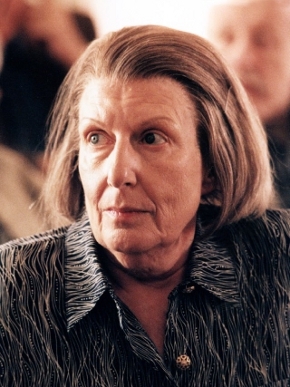 I still have the reams of e-mails where Susannah served as impromptu therapist to get me past the second season finale, and that responsibility probably would have fallen to all of you (imagine the reaction to Battlestar Galactica‘s recent mutiny arc, but about tragically underparented teenagers). 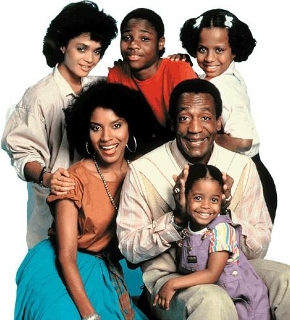 We had some serious love for that show. Little surprise, then, that we’d be the target audience for Starz’s new comedy about a mediocre catering business, Party Down. Take a lot of the talent behind Veronica Mars (Rob Thomas, John Enbom, and Dan Etheridge) and a lot of the talent that appeared on that show (the wonderful Ken Marino, Adam Scott, Ryan Hansen, and comedy genius Jane Lynch). Already gold. Add Paul Rudd as a writer/producer and guest spots from additional Veronica alums Alona Tal, Jason Dohring, and a naked Enrico Colantoni, and you’ve got a pretty powerhouse talent pool. Can the premise and writing give them enough to do? This pilot goes over some pretty well-trodden ground, including too-serious absorption of a racial sensitivity seminar and masturbatory misunderstandings. However, it also has Ryan Hansen singing along to a beat provided by his cell phone, eyebrow shaving, lots of cheese, and a naked Enrico Colantoni. It can be tough to sell a show about failure (especially in these dire times), and it can be even tougher to sell something as inside-baseball as wanna-be writers’ and actors’ failues. But there is a ton of potential here (next week’s preview looks like they’re going deeper, darker, and funnier already), and Party Down‘s first gig was funny enough to have us ordering more shrimp cocktail. The Baconeers like comic books. We get it. We’ve been to Comic-Con more than once and read Brian K. Vaughn’s website and are dying to see what happens next in Powers and are worried about the Watchmen movie and are excited that Pia Guerra is drawing the new Doctor Who comic. I once cried like a baby while reading Runaways (it was something the Leapfrog said. Shut up.). Really–we like comic books. Heck, we’re even very fond of Tim Sale and Jeph Loeb together. So it’s not an anti-comic worldview that leaves us easily irritated with Heroes. In fact, we wonder if it’s just the opposite–maybe it’s that we’re familiar with comic book structure and find it’s not working very well on TV…or maybe just on Heroes (even with Loeb and Sale on the team). So we try to avoid Heroes, because, to be perfectly frank, we haven’t got time for the pain. 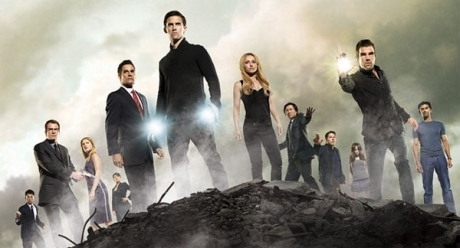 There are too many characters complaining too often about having superpowers, for heaven’s sake, and making too many stupid choices about too many alternate universes (I’m especially fond of Alan Sepinwall’s assertion that if you give either Peter or Mohinder any two choices in the world, they will pick the wrong one). Even Hiro seems to have the special power to get dumber every time he uses his superpower, which is just about the end of things as it ruins the only character worth rooting for. Why, then, can you catch me tuning in to Heroes on a fairly regular basis? In spite of accusations of masochism (which may not be entirely unfounded), it’s because they’re as good at casting as they are bad at telling a story that makes any sense. Starting in Season 1 with the reveal of Malcolm McDowell as an ultmate baddie, the show has larded in more characters than any three shows could handle–but they’ve gotten some of the most engaging actors around to play them. Veronica Mars love means we’ll follow Kristen Bell almost anywhere–even to Heroes. We got a kick out of the brief reunion with Level 5 villain Francis Capra (Mars‘ Weevil). Dana Davis‘ upcoming turn on Pushing Daisies reminds us that her Monica disappeared into the Heroes void to make more space for characters like Maya (sigh). Jamie Hector has brought his scary smoothness over from The Wire, and he was joined recently by former castmate and TV Bacon’s top Emmy vote-getter this year, the wonderful Andre Royo…who was promptly sucked into his own vortex just as we got to know him. Now they’ve topped themselves by introducing Robert Forster as Arthur Petrelli. This season has been a lot about the questionable family ties in the Petrelli family, and I’m guessing this means Peter isn’t really a Petrelli–Robert Forster can act. Please, Heroes, we’re begging you–either figure out how to translate comic book grammar to the small screen, or start pulling cast from The Hills and put us out of our misery. 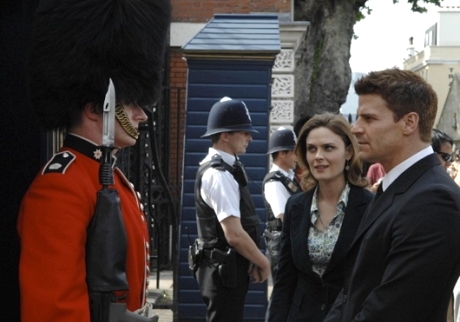 BONES and 90210: Are Two Episodes Better Than One? On Tuesday night, I was scuttling around packing canned meat and candles into a backpack and racing for a fenced wilderness fortress. Not because yet more hurricanes are headed for the coast, but because the seventh sign of the apocalypse had appeared. I was enjoying the new 90210. And this is coming from someone who absoultely could not stomach the original (and has trouble in general with soap operas about the traumas of the rich and pampered–I could only make it as far as the mint green suit in this week’s Gossip Girl before I gave up in despair). But the dialogue was bouncy and the situations kitschy (drugs in a hollowed-out book! Dum dum duuuuuuum!) and the nods to the original hilariously cheesy. And watching Tristan Wilds, I could squint and almost believe that the saddest kids on The Wire made it out of the slums. It extended past my bedtime, leading me to put off watching the second half until the next day, but I was happily interested in finishing and therefore pretty surprised that the show was almost universally panned the next day. When I saw the second half–which is really a second episode tacked to the first to create a super-sized premiere–I understood the critical roast. The zest brought by Rob Thomas and Mark Piznarski (the team behind the brilliant Veronica Mars pilot) left the zip code with them, leaving both characters and plot lines thinner than the actresses. Curiously, the same thing happened during Wednesday’s season premiere of Bones. Setting a lot of the action in the UK livened up a pedestrian mystery (with Torchwood‘s much-killed Suzie, Indira Varma, and Doctor Who‘s lesser medical student, Oliver Morgenstern, in the person of Ben Righton to entertain the BBC junkies among us), and the long-awaited arrival of Angela’s husband provided some intrigue back at the Jeffersonian. The novelty wore off across two hours, however, with the shift to a new mystery feeling very much like a…second episode tacked to the first to create a super-sized premiere. In both cases, we thought we were getting a treat–extra ice cream for being good kids. But in both cases, slowing down the pacing quickly deflated the excitement. If we’d seen only the first episode of 90210, would the CW have gotten a week of cheese-filled buzz instead of bad reviews? Would Bones fans be talking about whether Brennan’s new flirtation would come between her and Booth rather than the fast and inexplicable breakup between Hodgins and Angela if we’d seen only the first half? On the other hand, we fondly remember the one-two punch of seeing both parts of The West Wing‘s “In the Shadow of Two Gunmen” on the same night. 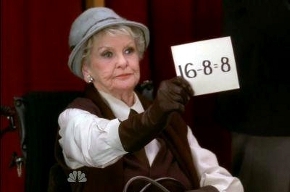 Maybe all that means is that neither 90210 nor Bones (as much as we like it) is as good as The West Wing. But is there anything more to be gleaned here as to when to go for the two-hour premiere and when not to? Because we’d like to think we deserve extra ice cream sometimes. – EW’s Michael Ausiello says Rob Thomas and Kristen Bell are talking about a Veronica Mars movie. Don’t dust off that Neptune Pirates letter jacket just yet, though. Between the two pilots already on Thomas’ plate and the chances of any studio greelighting a feature film version of a TV show that averaged only 2.5 million viewers, we’re more likely to get a Serenity sequel than to see this baby get off the ground. – The Emmys want you to help choose TV’s most memorable moments. Watch clips and vote online at emmys.abc.com until Sept. 15. Just don’t ask me why the M*A*S*H where Henry dies is part of the “comedy” category. – Can’t figure out what all the 90210 fuss is about? SoapNet will be airing a 24-hour marathon of the original Beverly Hills, 90210 on Sept. 1st to ring in the premiere of the CW’s spinoff the following night. – The Bad News: Sci Fi Channel has canceled Stargate Atlantis (the series will finish out its fifth and final season in January). The Good News: the network has greenlit a two-hour movie based on the series. – Scott Foley and Elizabeth Banks will each be returning to Scrubs this season, for one- and two-episode guest spots, respectively. Double squee! It’s Percy Daggs III and Wendell Pierce on In Plain Sight tonight. While Daggs has appeared in everything from Any Day Now to Freaks and Geeks to NYPD Blue, we loved him as Veronica Mars’ best buddy Wallace Fennel. 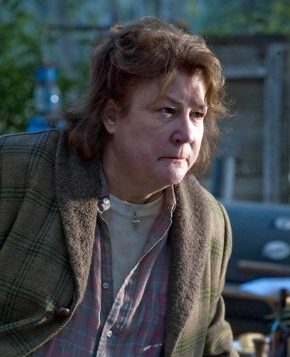 If you didn’t forgive them for the hackery that was “One Angry Veronica” when Wallace showed up at Veronica’s door on New Year’s Eve, your heart might be a titch hard. Wendell Pierce has been in a ton of movies and one-off appearances in shows as diverse as I’ll Fly Away and Women’s Murder Club, and he has a penchant for appearing in shows named after people (The Gregory Hines Show; The Brian Benben Show; The Weber Show. When did you ever think you’d see those shows together?). Perhaps most amusing, he shows up on Law and Order (Original Flavor) every three or four years–as different characters. He was at his most brilliant, however, as Detective Bunk Moreland on The Wire, a cop who drinks way too much and lets Jimmy McNulty get away with way too much, but who can’t help being the one guy standing tall in the end. It appears the shoe is on the other foot tonight, as he’ll have to deal with Marshal Mary and Marshal Marshall. I suspect he’ll like the latter better.